For the third year in a row, Luxe Linen hosted their Luxe Launch, which serves as a trendsetting, networking function for the wedding industry’s top designers and planners. A consultant is paired with a florist, and the design duo uses Luxe Linen’s newest collection to help with the creation of any themed tabletop. 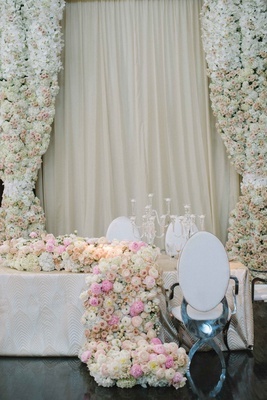 When planning the décor for a wedding, it’s typically recommended to pick a statement piece and work from there. 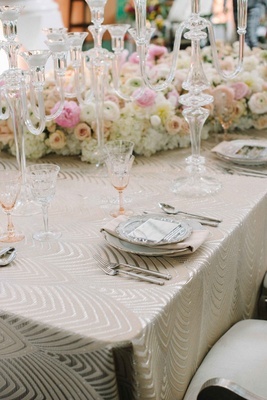 After seeing the stunning “Cream Cleopatra” linen, everything fell into place. 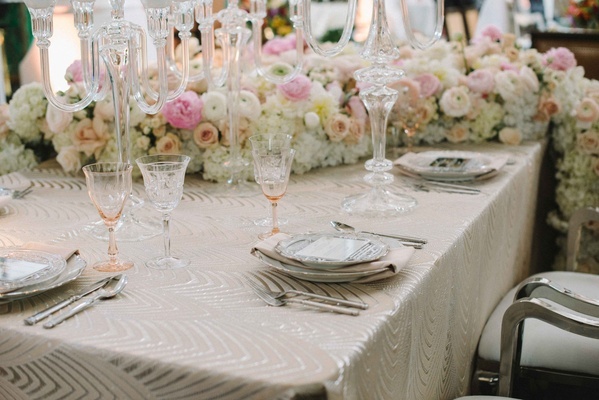 “Our table was mainly driven by the soft color of the linen, juxtaposed with the strong metallic print,” shares Yvonne Van Pelt of Empty Vase and Kerrie Underhill of Platinum Weddings by Kerrie. 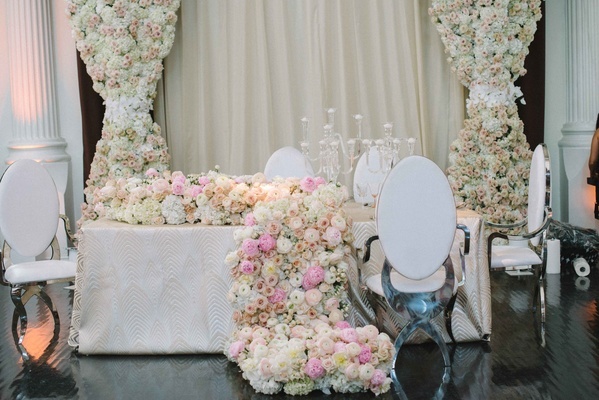 Their romantic tablescape was titled “Modern Luxe Enchantment” to demonstrate the more contemporary elements that were incorporated into the design. 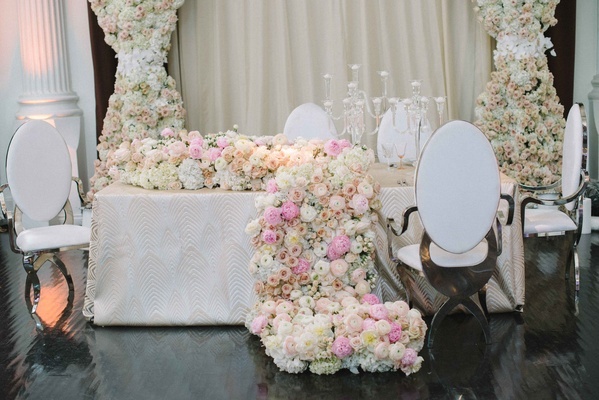 The standout of the table would easily be the stunning floral details created by Empty Vase. 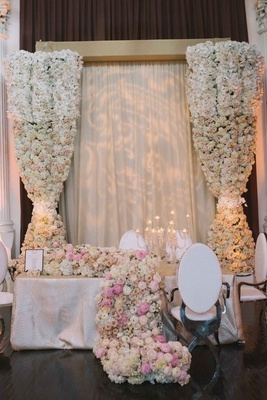 “The gorgeous floral curtains that framed the design were showstopping – not a single person passed by without gasping in awe!” reveals the creative team. 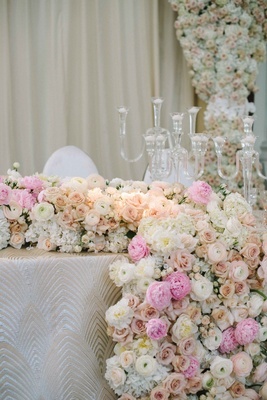 “[Another] favorite element was the floral waterfall that cascades across the tabletop down onto the floor.” The featured blossoms showcased neutral hues for the towering curtains, but the runner allowed for some pops of color – primarily peaches and pinks. 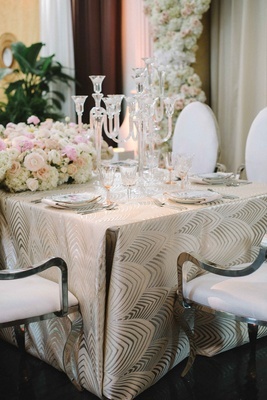 The color scheme perfectly complemented the soft linen with metallic design elements. The creative team worked together well: “We knew exactly what chairs from Revelry Event Designers would add the modern edge,” explains Kerrie and Yvonne regarding the planning process after their initial discussions. 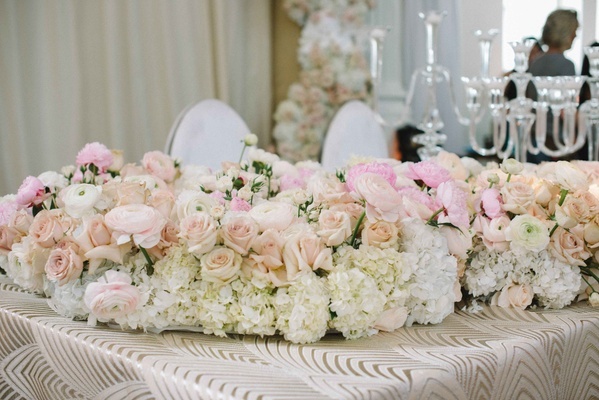 In addition to the jaw-dropping floral design, the team used a common trend in a new way, adding a unique element to the tablescape. 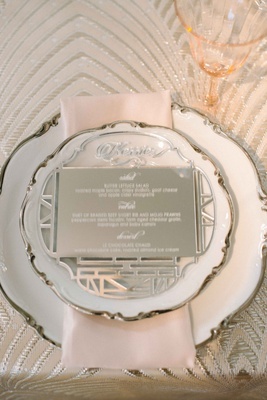 Mirrors seem to have replaced chalkboards as the new signage to use at weddings, but that is not the direction this creative team took. 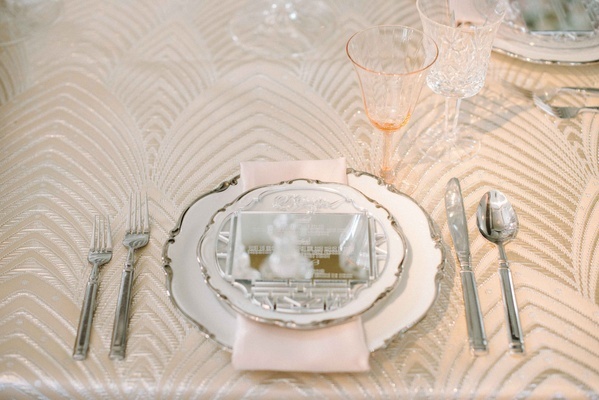 Each place setting had a small, engraved mirror that detailed the menu for the evening. 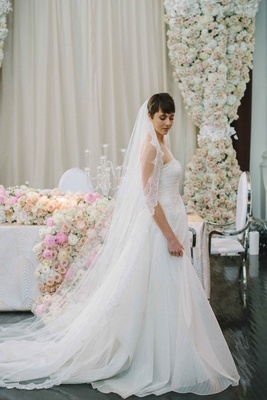 Lastly, the duo's design was complemented by the bride's A-line wedding dress featuring an ivory French silk tulle top with a striped and gathered organza skirt by Jinza Couture Bridal paired with a French Chantilly lace cathedral veil – a dramatic look that echoed the feminine tablescape.